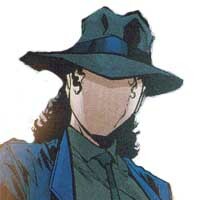 Renee Montoya was one of the most reliable members in the GCPD. Hard work and dedication granted her a position as Detective 3rd class after only 4 years. Born in a modest family immigrated from the Dominican Republic, Renee's parents owned a grocery downtown and her younger brother Benny works in a carrier at sea. Renee is very constant and prone to overwork and she could have gone to the university with a grant if she had wanted to. However, she decided to stay in a local community college and help her family. Montoya eventually attended the police academy and became a cop to help people. Initially, she was paired with Harvey Bullock to patrol. The people in the department thought they would not last a day because Harvey was a big tough guy and Montoya liked to go by the book. However, Montoya was patient and she had a soothing effect on Harvey. Harvey soon learned to respect her and they both became good friends. Montoya recently quit the police force and was taken on a journey by Vic Sage/The Question. At first Renee did not know why he chose her but then later discovered that he was dying and that he intended her to be his replacement.